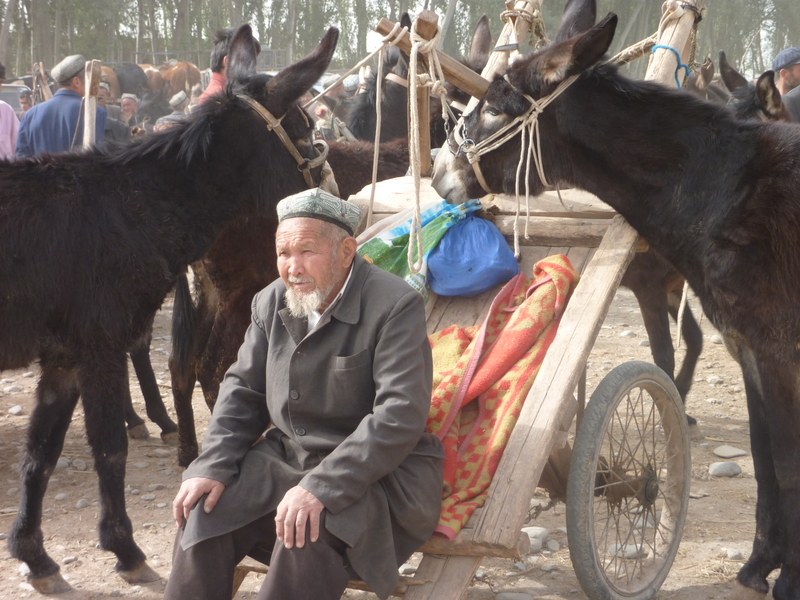 For many years I dreamed of crossing the Taklimakan desert and arriving at the fabled city of Kashgar. 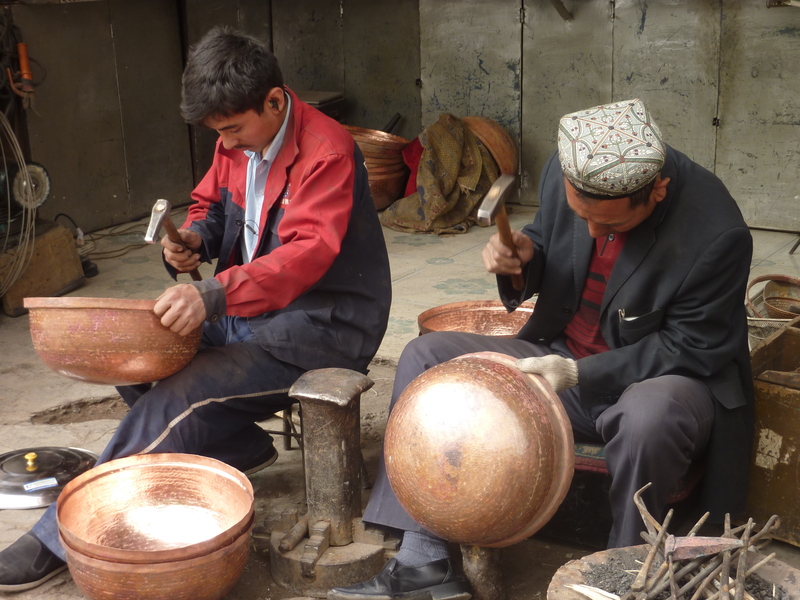 Kashgar Sunday markets…a phase evocative of colour and drama, an exotic bazaar on the Silk Road, crossroads for tribes who would gather from the most remote parts of the world. These were mountain people from the Tien Shan range and people from the steppes of the now ‘Stans. They even travelled through snow from snow leopard country and from India and the high culture of China. They came to trade everything from camels to silks. 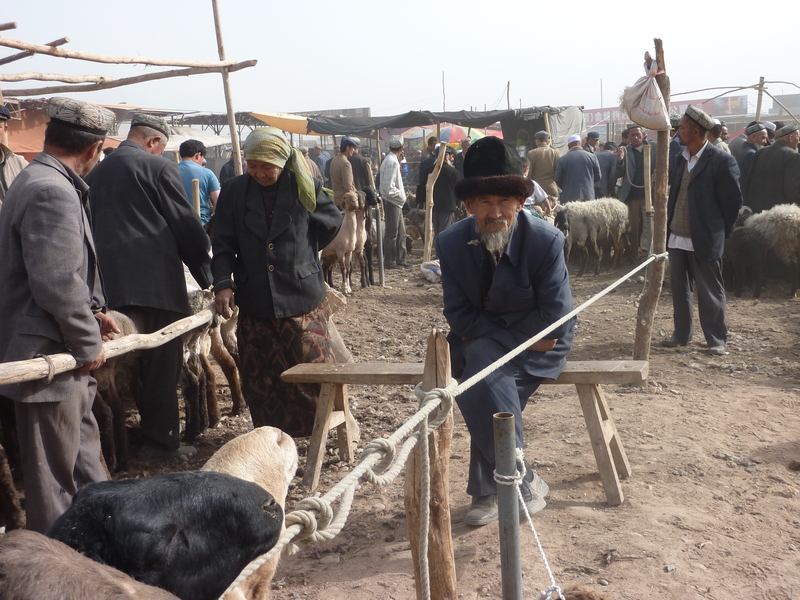 Today they still come to trade at the Sunday market at Kashgar. Here several routes of the Silk Road came together……. north from Islamabad, east from Persia. I met my friend, Gill, in Beijing, perhaps to be the standout city of the 21st century – if the air pollution doesn’t kill it first. 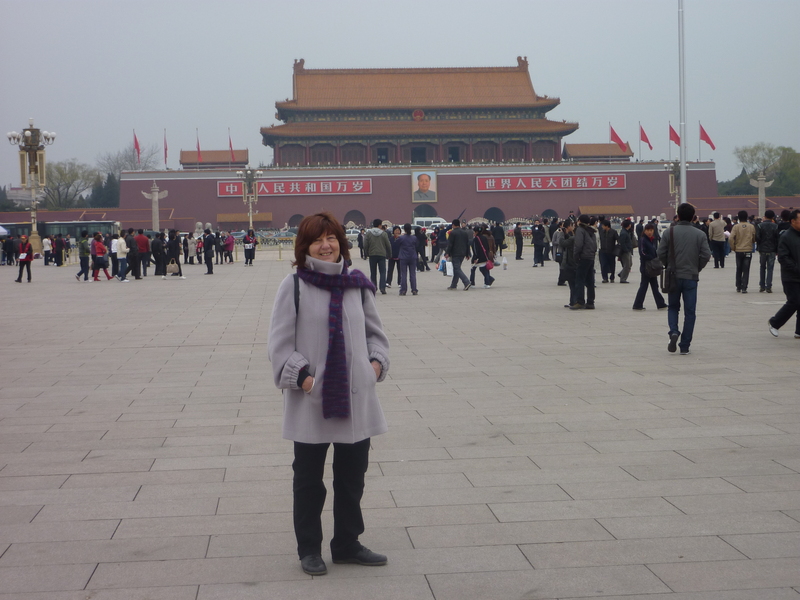 Ticked the usual tourist boxes – the Summer Palace, Tiananmen Square etc. – little changed (except for the crowds) since I first saw them in the early 80’s but that was another story, a real spin-out — the place was still pretty closed back then. 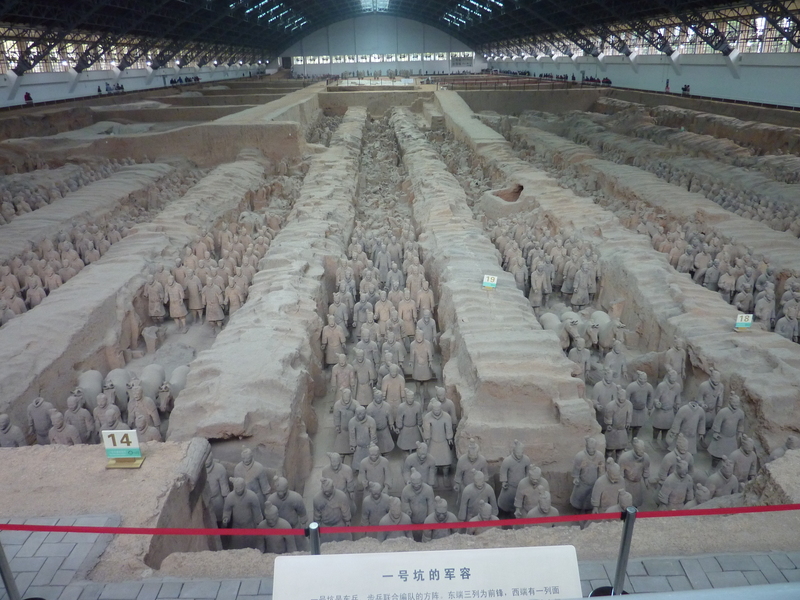 Onto the beginning of the Silk Road, Xian and its fabled warriors. It would be wrong not to include a picture of at least one chamber of the famed warriors. The scale is amazing. A walk around the city walls of Xian watching the locals practise tai chi in the parks below and a quick look at the glassy department stores and then it’s off to Lanzhou. 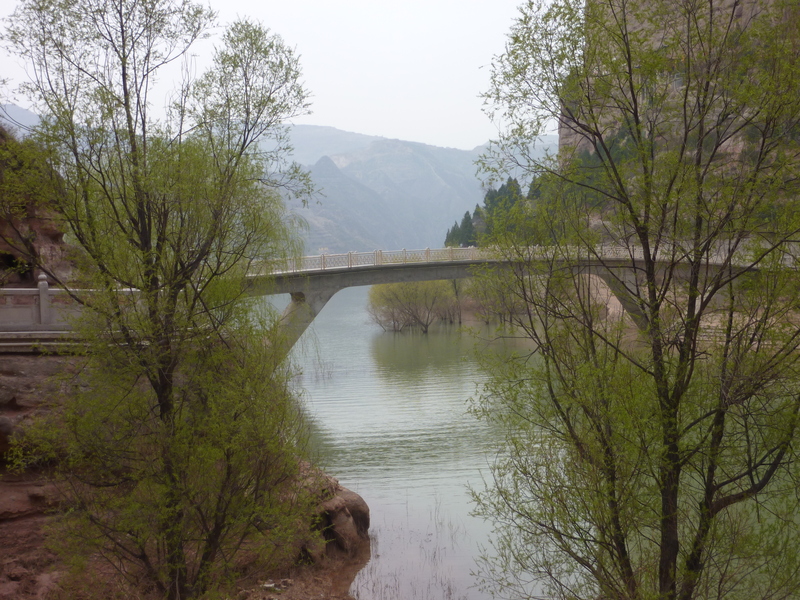 The Yellow river flows to the north of the city which straddles the sides of a narrow valley. 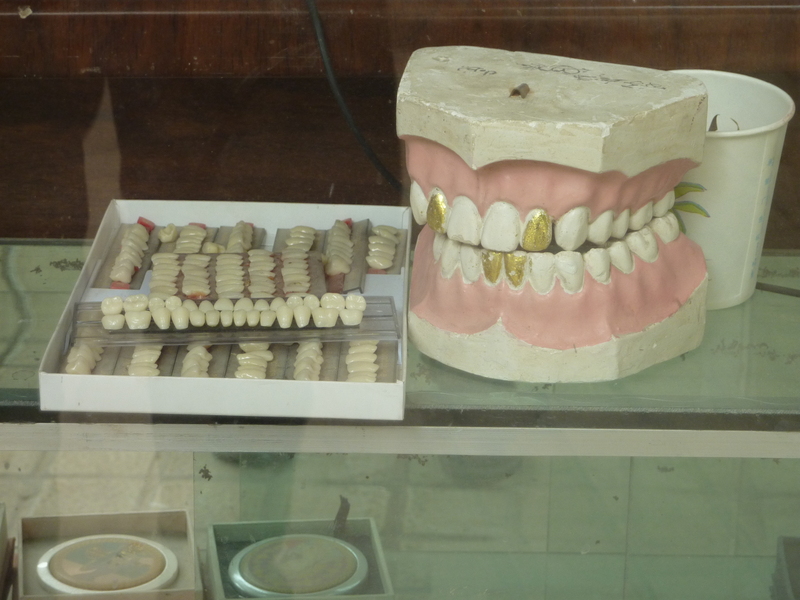 Here in this industrial town the earliest archaeological remains of the first Chinese settlements are found. Now it is also home to the Moslem Hui people. Somedays unexpectedly, in small towns you pass through there are people who make your heart sing! From here we go by boat to visit the famous Bingling Si Caves where the Buddhists carved their beliefs into the cliff face around 420AD. And there are eternal landscapes. We had planned to go to Xiahe or “little Tibet”, a monastery town surrounded by mountains on the Tibetan plateau and mostly populated by ethnic Tibetan with some Han and some Hui peoples. Other travellers tell us it is closed; we cannot go as it is the anniversary of the uprising by the monks fighting what the Dalai Lama called ‘Chinese cultural genocide”. 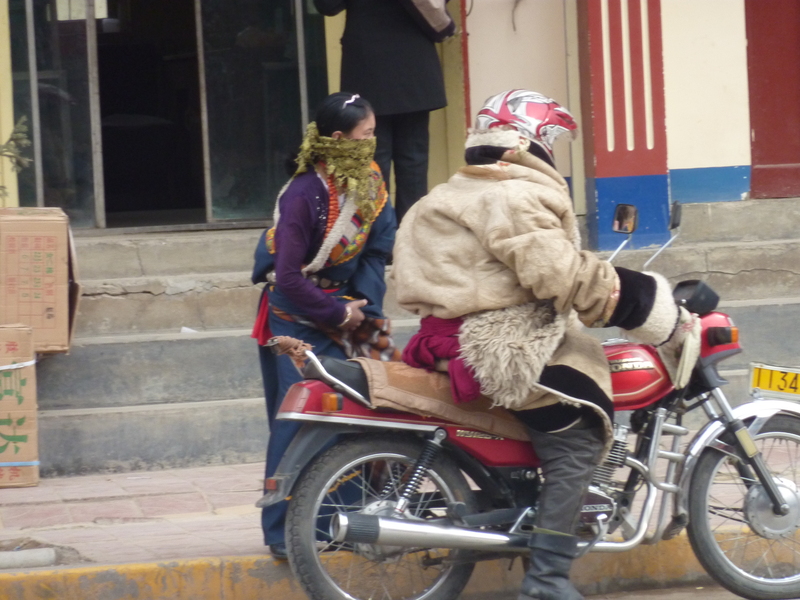 A Tibetan family going home…the Dalai Lama calls Chinese action towards these people “cultural genocide”. ” In Xiahe, Gansu province, protesters hurled rocks and bricks at police headquarters and smashed windows of Han Chinese shops and buildings. The double steel doors of the local police headquarters was shredded by Tibetans armed with traditional gogur weapons – a type of axe formed from yak skin and metal and used to fend off wolves. Last night locals watched riot police performing drills in Elephant Square and along the main road. Anyway despite the warnings, we went and visited the Labrang monastery, one of the six leading Buddhist Lamaseries in China. Inside the monastery many yak butter sculptures. 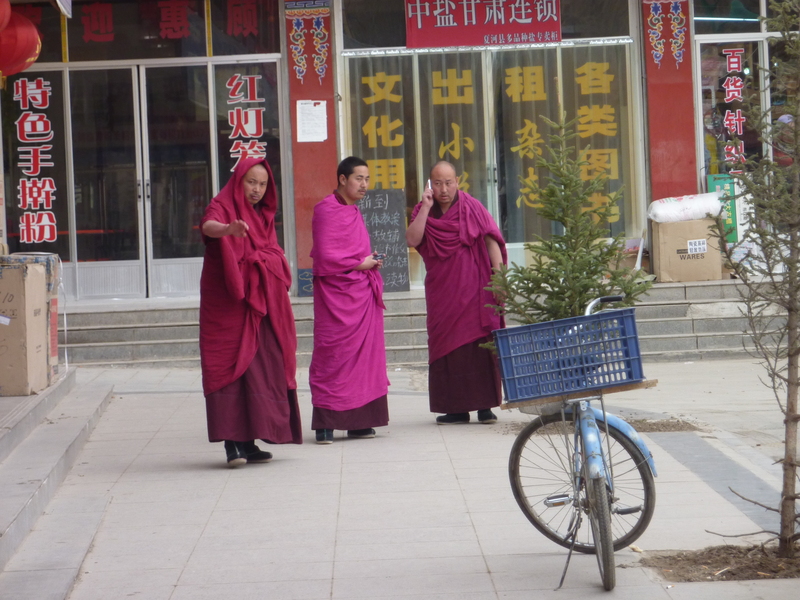 Wandering the town and the satellite monasteries was another time. 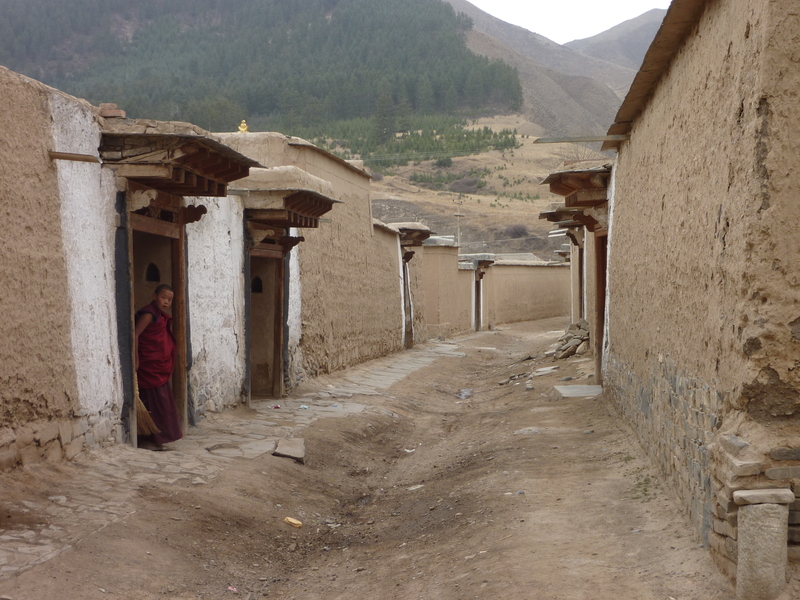 Here is a typical row of monks’ dormitories…must be cold in winter! Who is the monk calling? 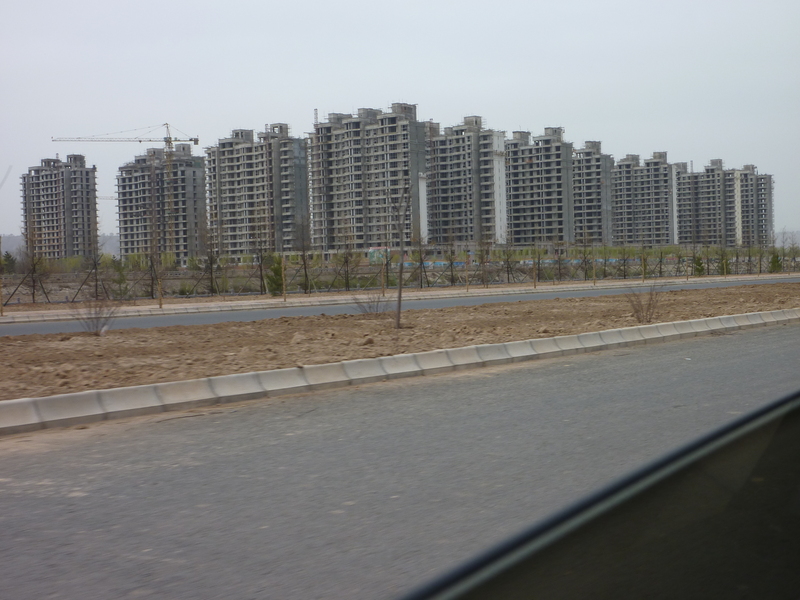 On the road back from Xiahe we come across one of those compare and contrasts of Chinese — one of the “new cities” clusters of stand alone high rise that appear ghostly. 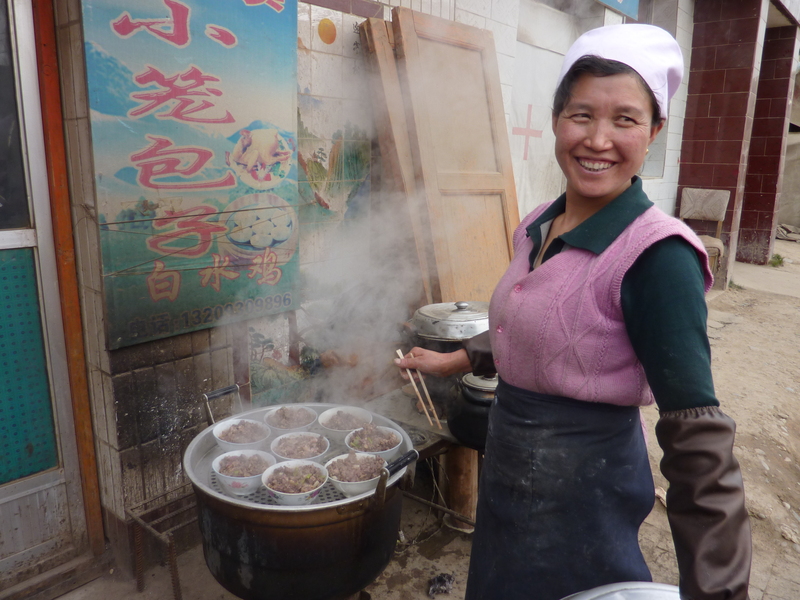 We moved deeper into western China and the autonomous region to arrive at Jiayugan. Here in a remote and beautiful mountain pass at the western end of the Great Wall is the fairytale Jiayu Fortress. The fortress was once the gateway to the Unknown! 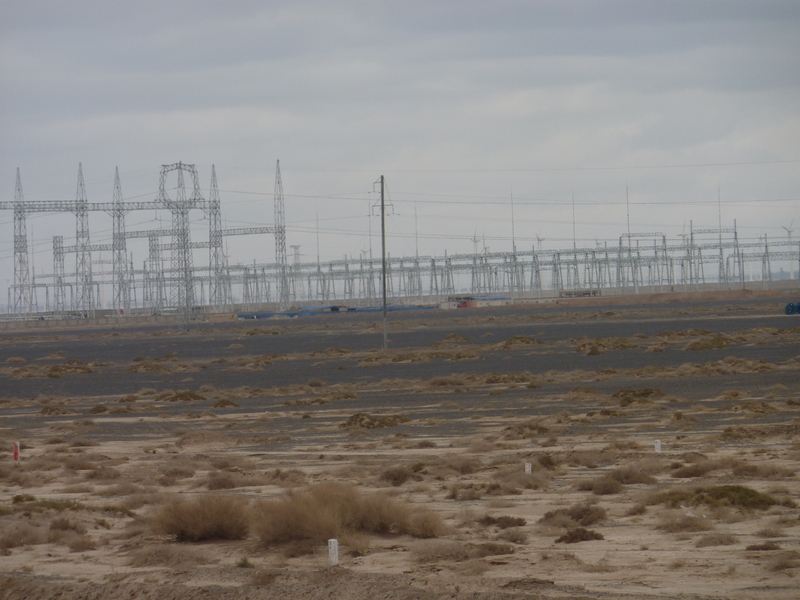 Now, these transmission lines cross the Gobi desert in the once “Unknown”. Further along the Silk Road we come to Dunhuang an oasis town surrounded by rolling sand dunes. 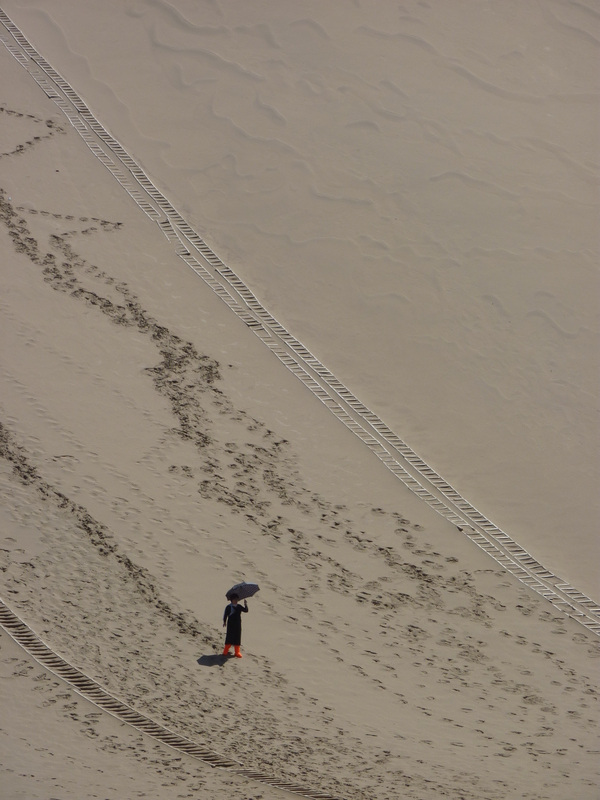 The singing sands at Dunhuang. 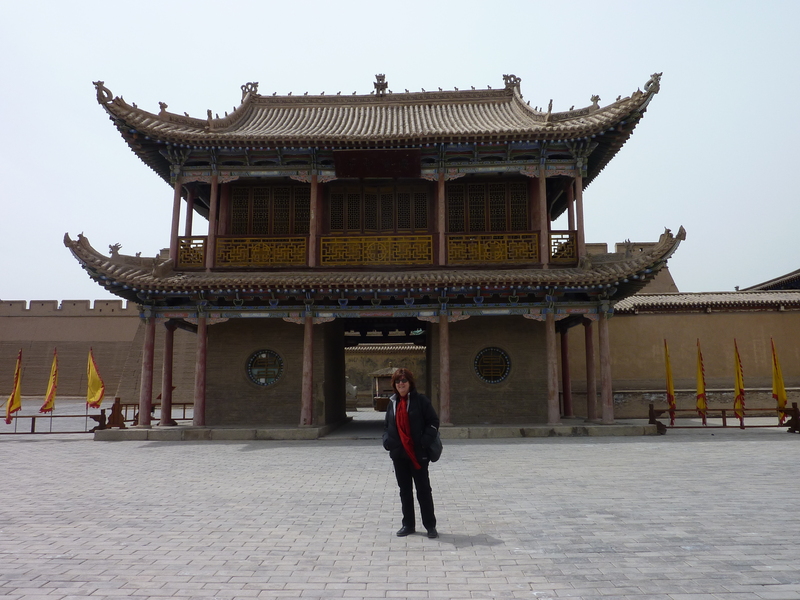 This was the town where the northern and southern Silk Road routes divided. 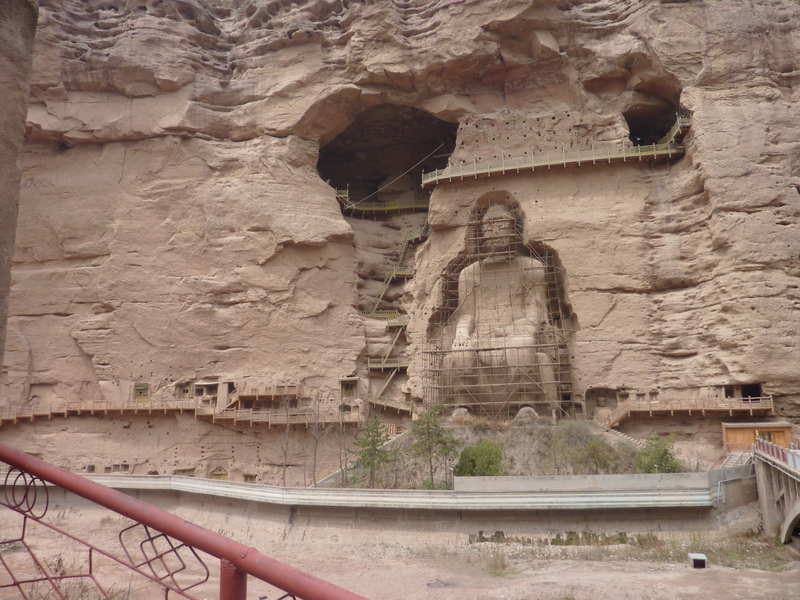 From here we visit the UNESCO World Heritage listed Caves of a Thousand Buddhas where the first caves were cut out in 366AD and 492 temples built over 1000 years. In 1900 11th century documents were found in the Library Cave. 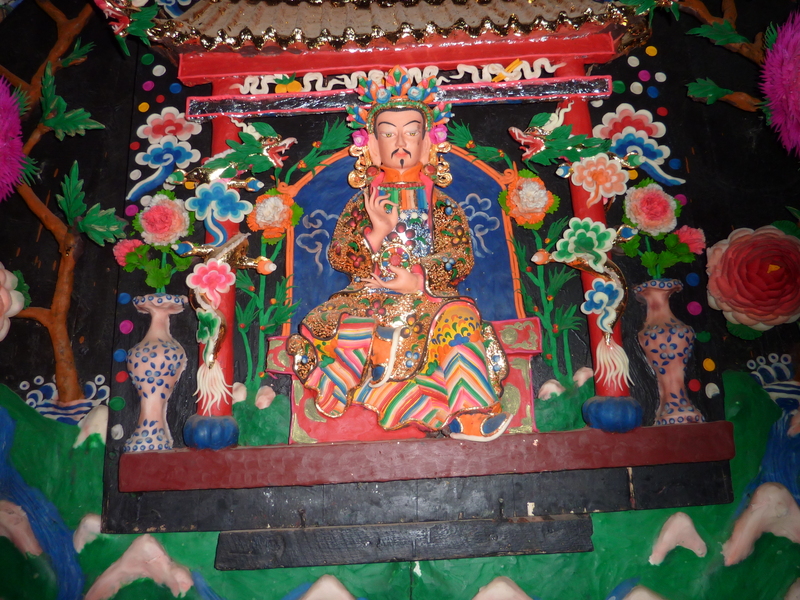 Buddhist, Dao, Manichaeism and Nestorian manuscripts are all there. The art and sculptures in the caves give hint of an intricate and beautiful heritage. 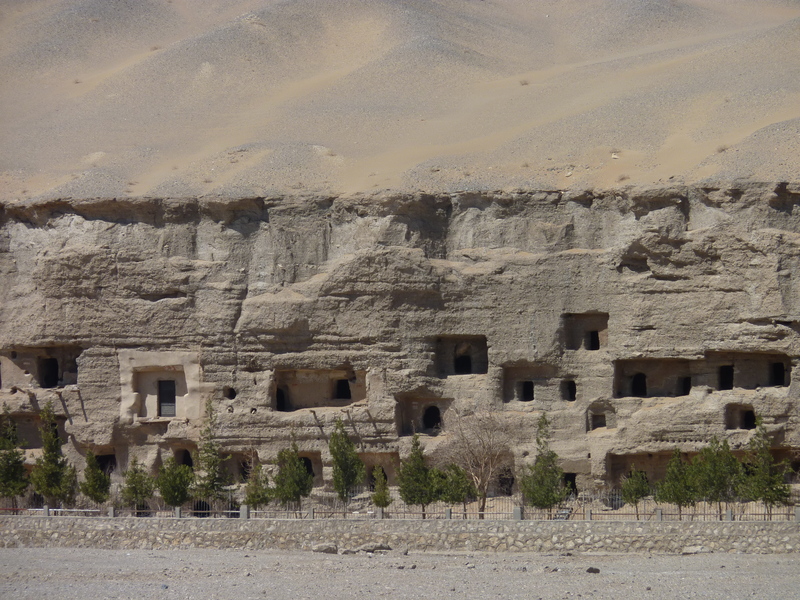 The World Heritage caves at Dunhuang. 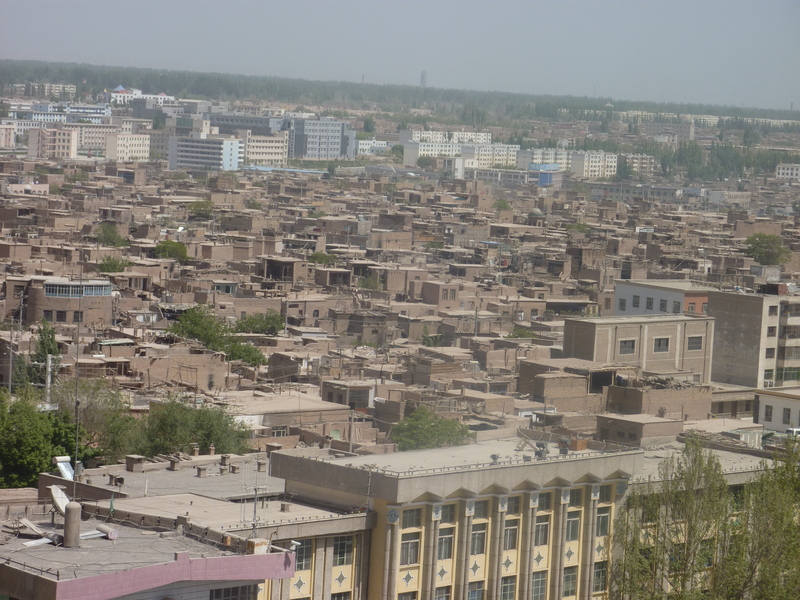 Next Turpan; in 803 the Uyghurs seized this town from the Tibetans. It is the second lowest city in the world after the Dead Sea and remembered by me mostly for the sight of (Uyghur) people under archways of vines in central malls walking backward, as is the custom, for the exercise. The people here are among the longest lived in the world. When asked, the longevity is put down to the fact that babies’ heads are shaved and sunned for the first few years of life and to local milk, drunk daily. 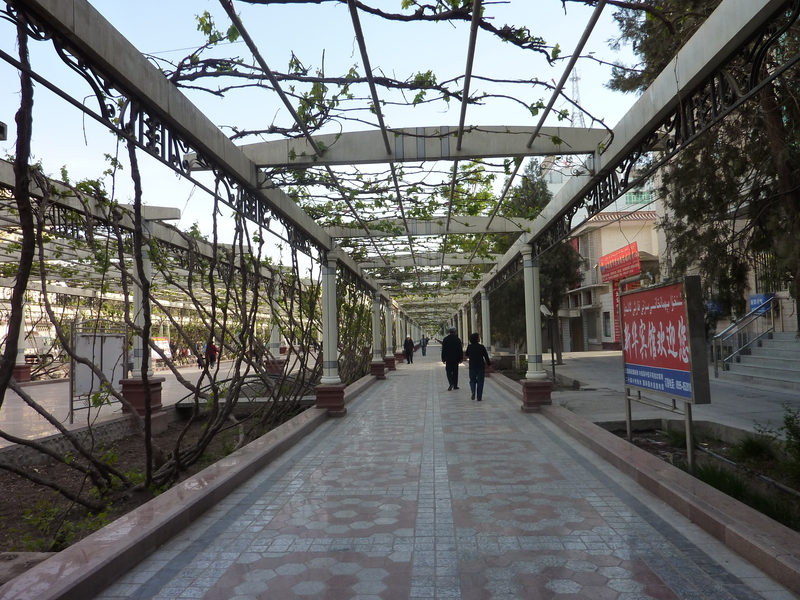 The gracious walkways of modern Turpan. Amazing to know that the Roman legions got this far. 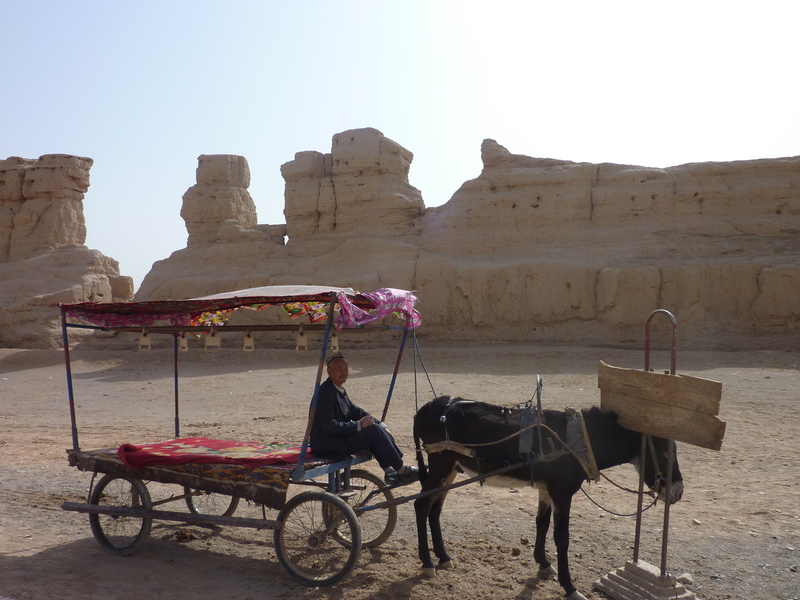 We visited the ruined 2nd century BC city of Jiahe and the Gaochang Ruins from the 2nd century AD in the Gobi desert. Once an important Silk Road stop the city was ruined in the 14th century. Transport through the ruined city. Then an overnight train trip through the lower Tien Shan mountain passes and skirting the Taklimakan itself. The Taklemakan is the world’s second largest shifting sand desert with about 85% made up of shifting sand dunes. 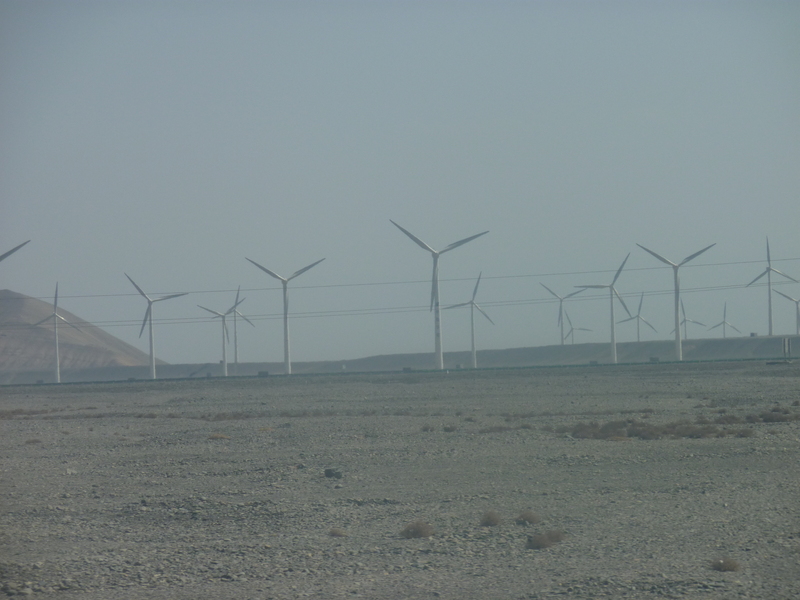 arid, remote, it has archeological remains back to the Greeks and modern wind farms. The Chinese are apparently working on a technology which will allow them to build wider highways across the desert (there is already one) – all the better to get to the minerals underneath and to the foothills of the Himalayas. Kashgar finally! An illusion of my dreams. Here is a meeting place that has been lived in by people from the B.C. Old Han dynasty, the Arab Caliphate, the Mongol. Here was a city that Marco Polo wrote about and more recently was an outpost in The Great Game. 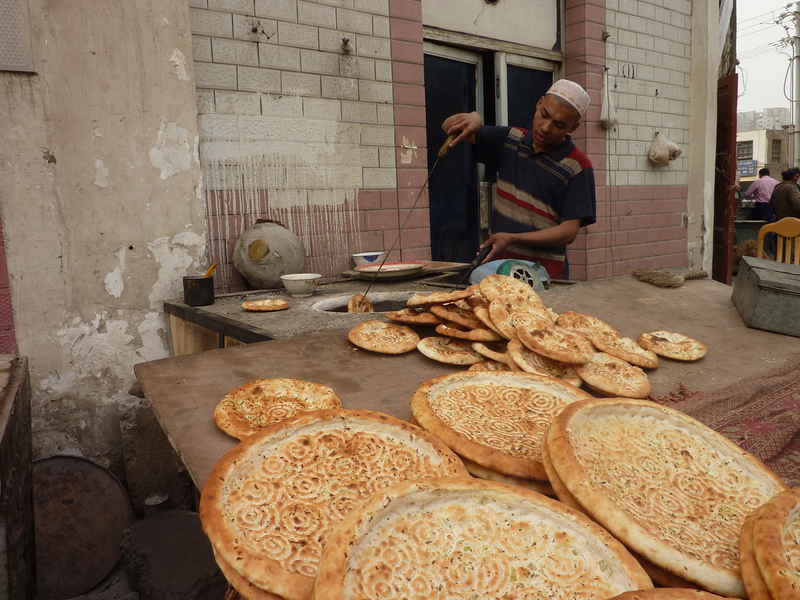 Kashgar = the old fabled Uyghur town surrounded by the modern Chinese city. In 2010 there was still a life being lived amidst the demolitions of the old city. In the (then) remains of the old town some old crafts remain. 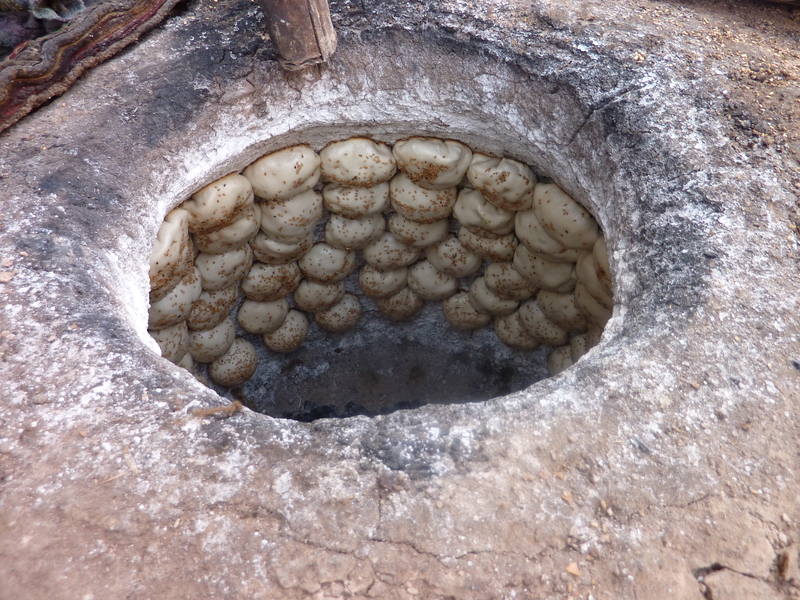 The bread is baking. There is a hint of times gone by at the famed Sunday bazaar where a few camels, racing ponies and other livestock are for sale. A few sad camels are still for sale. Our hotel room looks down on the remains of the old city. Overall the Chinese seem hell-bent on knocking down the evocative Uyghur mud-brick city and replacing it with a new “western” city. (I thought I was in the Sydney suburb of Chatswood, a Chinese dominated mini high-rise consumer magnet). They say it is to earthquake proof. In case you don’t think this Chinese development causes problems with the dominant and traditional Uyghur the constant circling of the city by army trucks on the lookout for trouble might be a clue. In 2011, dozens were killed after rioting against the Chinese masters. The news that the government plans to move an additional 500,000 Chinese into the ethnically Uyghur city seems to confirm the intent to overwhelm any dissident movements. 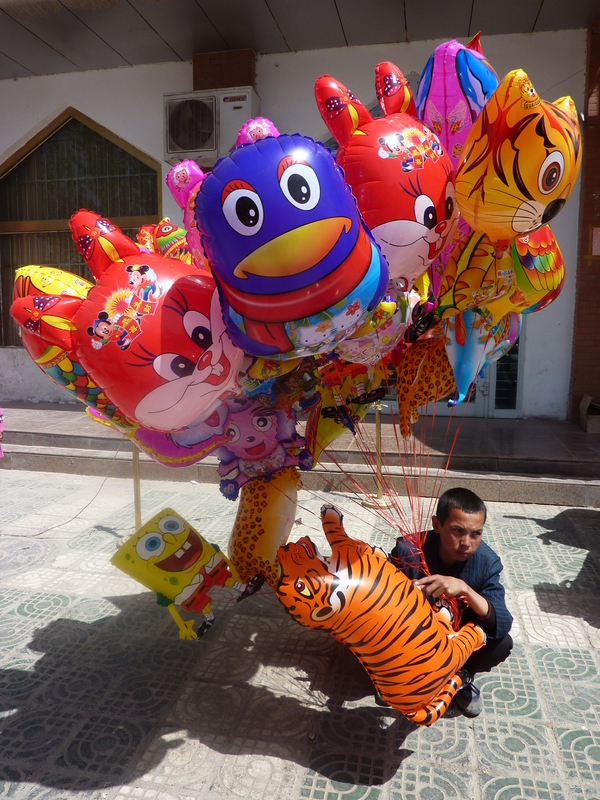 Despite it all, children still love balloons. Some say it’s all about the line of defence/attack on the nearby Indian border. From here soldiers move out to protect the water flows from the Himalayas which will one day be the literal lifeblood of this part of China. 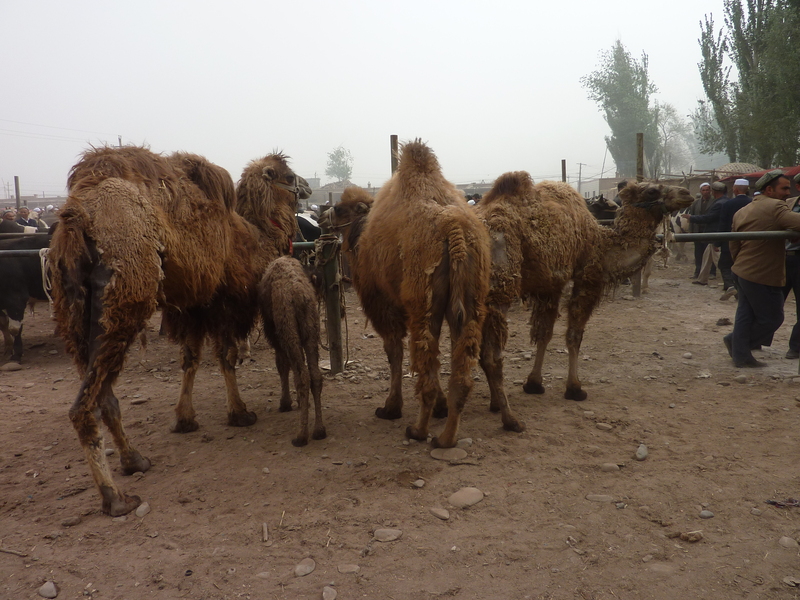 An insistent desert dust storm meant we were delayed in a bar in Kashgar for a day or so and only had time for dinner in Urumchi, the capital of this Xinjiang province and the world’s most landlocked city. It was sad to miss the museum for there are the Tarim mummies dating from 1800 BC; some are said to be from Indo-European line; others Mongol. Research continues. The Silk Road remains remote. Some towns, landscapes and ruins along the way hint at the drama of the caravanserai. Modern Chinese culture is closing in.